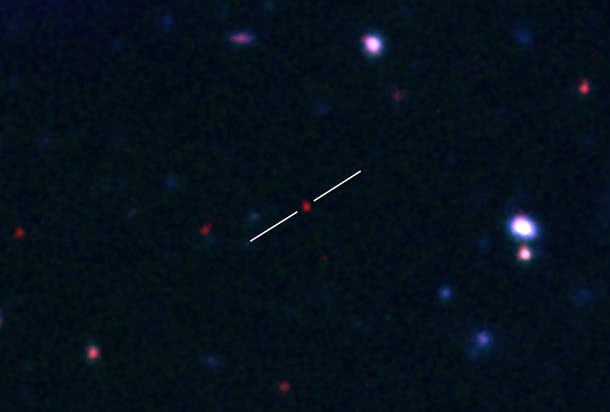 A deep optical image of the afterglow of the gamma-ray burst GRB 090429B, arguably the most distant object known in the universe.The light from this object has been traveling towards us for about 13.2 billion years, or 96% of the age of the universe. Since the universe is not static but expanding, today this object is much farther away than 13.2 billion light-years – more like about thirty billion light-years. It tells us that 13 billion years ago, this event was more than 17 billion lightyears closer than today. The expansion of the universe is like blowing up a balloon with stars painted onto its surface; an expansion of spacetime itself. The most distant objects in the universe are also the oldest — or at least that is how they appear to us, because their light has had to travel for billions of years to get here. They are also extraordinarily faint since they are so far away, and only in the last decade have astronomers been able to stretch their vision using the newest telescopes and clever techniques. One such innovation occurred with the launch of the NASA Swift satellite in 2004; it searches for bursts of gamma-ray emission, called GRBs. These flashes, thought to result from the especially spectacular deaths of massive stars, are the brightest events in the cosmos during their brief (only seconds-long) existence. But because they are so bright, they can be seen even when they are billions of years away. The scientists were unable to detect any faint trace of the putative galaxy in which this massive star once lived, helping to confirm the great distance of this GRB. Other important details in their new paper confirm that the object is similar to more nearby GRBs, and consequently that – even at this early stage of cosmic life – at least some stars already resembled stars in our local universe.